A trio of Holocaust survivors, who as children in 1945 were liberated from Auschwitz, are miraculously reunited 70 years later in New Jersey. Michael Bornstein never talked about how he survived the Holocaust. The retired pharmaceutical researcher in northern New Jersey, now 77, preferred to focus on the positive. His memories of Auschwitz were fuzzy at best. He’d been only four years old when the Soviet army liberated the notorious concentration camp in southern Poland in January 1945. It wasn’t until 2012, when his oldest grandson was preparing for his bar mitzvah, that Michael felt the tug of his past. He owed his grandson their story. He did some research online to confirm bits and pieces with his daughter Debbie Bornstein Holinstat, a journalist. They discovered a grainy black-and-white photo. A still frame from film taken by the Soviets. There was a young Michael, gaunt in striped prison garb. Showing an identification number—tattooed onto his forearm by Nazi soldiers—to the camera, alongside 10 or so other children doing the same. 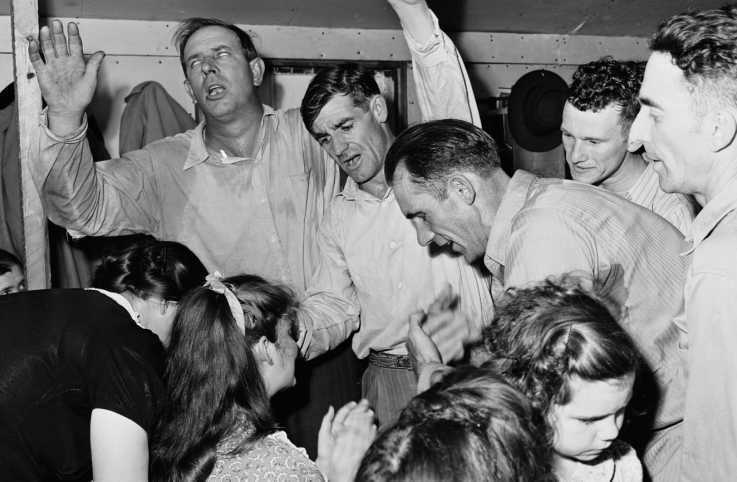 While in the camp, they had no names, only numbers. Michael was familiar with the image. He’d seen it decades earlier in a 1980s film that used Holocaust-era footage. This time, though, the photo was posted on a Holocaust denial site. Michael was incensed. For decades, he’d been silent about the horrors he’d seen and experienced. No more. The photo sparked something in him. Not just anger, but a need to defend the truth. With his family’s help, he meticulously combed through records and pieced together testimonials. The result was a stirring memoir, cowritten by Debbie, called Survivors Club. When it came time to pick an image for the book’s cover, Michael chose the photo that started it all. Nothing imparted survival quite like it. As many as 1.5 million children died during the Holocaust. Of the hundreds of thousands of children interned at Auschwitz, only 52 under the age of eight survived. It was a miracle that Michael had even lived to tell his story at all. But the universe had a few more miracles to give. A month after Survivors Club was published, an e-mail popped up in Debbie’s in-box. 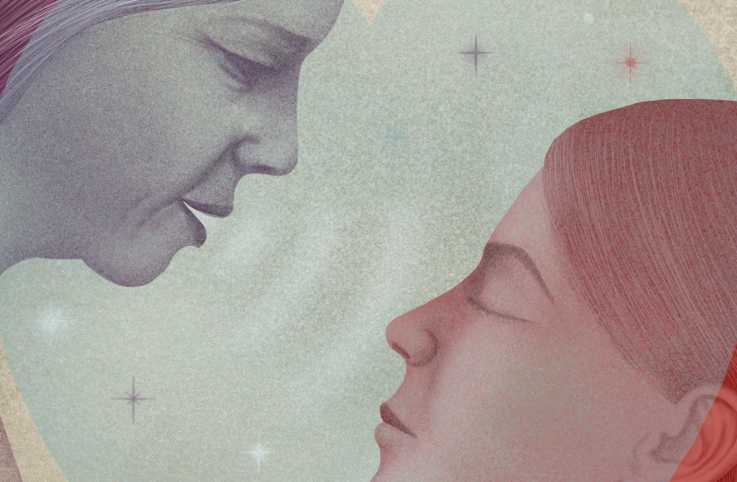 Tova Friedman had been thumbing through a magazine on her lunch break when she saw it. An advertisement for a book written by a Holocaust survivor. She nearly fell out of her chair. The photo on the book’s cover was the same image that had been hanging in Tova’s living room for the past 20 years. Tangible proof of her survival. 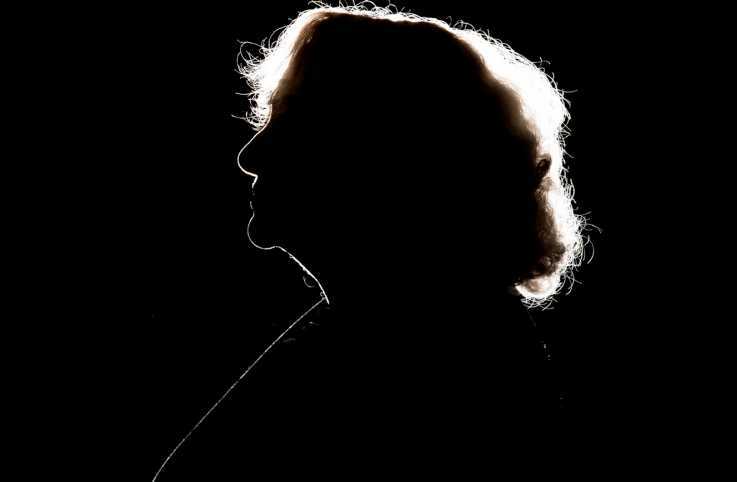 Born in Poland in 1938, Tova spent her earliest years in a ghetto in Tomaszów Mazowiecki. When the Nazis rounded up the ghetto’s youngest, her parents hid her in a double-ceiling crawl space. The ghetto was liquidated in 1942. Eventually Tova and her mother were sent to Auschwitz. Her father was sent to Dachau, in Germany. The children’s barracks at Auschwitz were emptied one by one. Even at her young age, Tova knew it would be her turn soon. On a bitterly cold day in 1944, the Nazis ordered the children in her barrack to line up and march. When they reached the yard outside the gas chambers, the guards commanded the children to undress. They waited. And waited. Tova shivered as the Nazis argued in German. Finally, a guard barked new orders: “Get dressed!” The children marched back to the barracks. After the war, Tova and her mother reunited with her father. They snuck out of Soviet-occupied Poland to Berlin and then to the United States. Tova grew up in Brooklyn. She met her husband at Hebrew school. They moved to Israel and raised four children. In 1977, her husband was offered a job in New Jersey and the family returned. Tova went back to school, became a social worker and eventually the director of Jewish Family Service in northern New Jersey. The busy grandmother of eight still works there as a therapist. 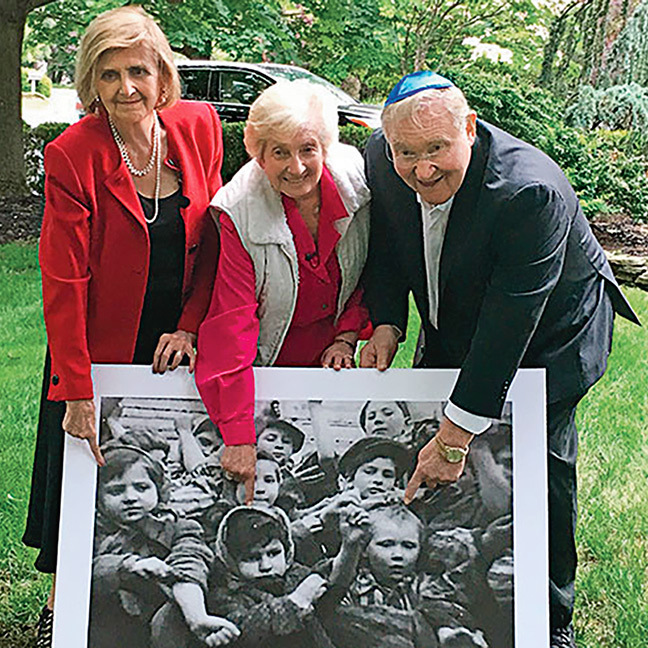 Several years ago, before Michael’s book was published, Tova was at a fund-raising event at her grandchildren’s school when that photo of the child survivors of Auschwitz flashed on the presentation screen. “Why are they showing that picture of me?” Tova asked the man sitting next to her. The girl next to Tova in the black-and-white photo was Sarah Ludwig. The same woman, Tova later discovered, who was her grandchildren’s first-grade teacher. Sarah Ludwig learned the importance of hiding at an early age. Born in Radom, Poland, she was only two when her uncle arranged to have her smuggled—in a shipment of potatoes—into the labor camp her parents had been deported to. In August 1944, Sarah and her parents were sent to Auschwitz. She remembers her mother holding her as the Nazis tattooed her arm. The family was split up after that. Her mother was sent to a camp in Czechoslovakia, her father to Dachau. Four-year-old Sarah somehow survived in the Auschwitz children’s bunk. She’s not sure how. She can’t remember liberation day or the moment the photo was taken. Only the sudden appearance of the Soviets, who sent Sarah to an orphanage in Krakow. Her mother, learning Sarah was possibly there, boarded a train from Czechoslovakia to Poland. It was on that train that her mother incredibly ran into her own father, Sarah’s grandfather, whom she hadn’t seen since before the war. He’d also boarded the train in hopes of finding Sarah in Krakow. They eventually met up with Sarah’s father in Germany. 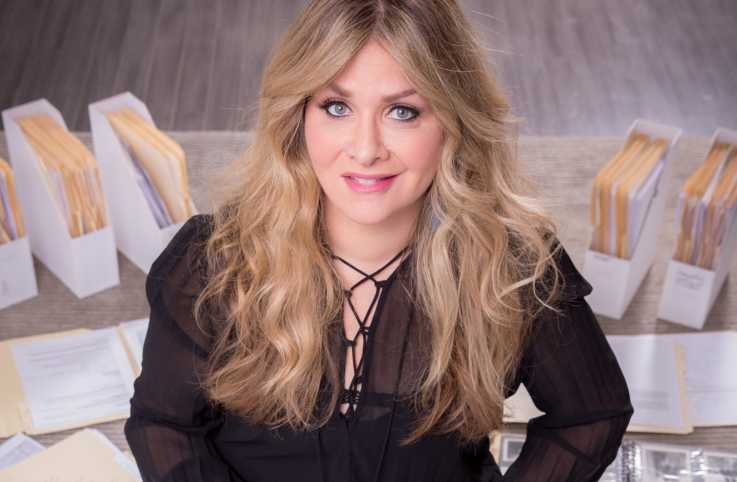 The family spent the next few years moving from place to place before settling in the U.S. Sarah grew up in the Bronx, got married and moved to New Jersey, where she taught first grade at a Jewish day school. In her spare time, she traveled the tristate area, educating children about the Holocaust. Also destiny? Discovering that two of the children she’d posed with in a 1945 photo were still alive. And closer than she could’ve ever imagined. Michael had his own remarkable story. He was born in the ghetto of Zarki, Poland, in 1940. His family was deported to a labor camp in 1943, then to Auschwitz in 1944. There, his father and brother went to the gas chambers. His mother, Sophie, and grandmother Dora were sent to the women’s barracks. Children too young for work were usually killed. But Michael wasn’t. Like Tova, for reasons he’ll never know. Sophie and Dora smuggled Michael into the women’s barracks before Sophie was moved to a labor camp in Austria. Weeks after she left, Michael awoke in the middle of the night with a raging fever. Dora snuck him into the infirmary. A Nazi doctor there took pity on them. He treated Michael and allowed Dora to sleep beside her grandson. That’s where they were when thousands of their fellow prisoners were forced to embark on the Nazis’ infamous Death March. Because of Michael’s fever, they were spared. After the war, Michael and his mother reunited. They moved to the United States in 1951. Michael met his wife at the University of Iowa. They raised four kids in Indianapolis before settling in a town in northern New Jersey. Less than an hour from where two girls in the photo were living. Michael’s daughter Debbie read Tova’s email, stunned. She called Tova right away. “I know one of the other girls in the photo,” Tova told Debbie. “Her name is Sarah.” Debbie jumped into action and organized a brunch for the three survivors. 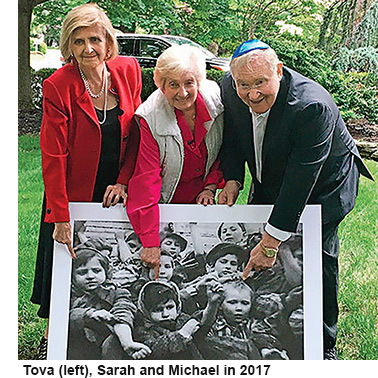 On June 4, 2017, more than 70 years after they stood before the Soviet cameras at Auschwitz, Michael, Tova and Sarah embraced. They felt instant camaraderie—a difficult shared past mixed with a sense of destiny. Bashert. For Sarah, it was as if her family had expanded—the three survivors had more than 20 grandchildren among them. “That day, I kept touching my eyes, wondering if I am dreaming this or if it is real,” she told local reporters. For Michael, the experience brought everything full circle. He found the closure he’d been searching for since the day he saw the photo on the Holocaust denial site. Read an excerpt from Michael Bornstein's book, Survivors Club: The True Story of a Very Young Prisoner of Auschwitz.